The transfer of the stage adaptation of George Orwell’s novel 1984 by Robert Icke and Duncan Macmillan from London to Broadway is timely. The story of a dystopian world where everyone is watched and watches each other, where truth is brutally crushed and all must obey the all-seeing, all-knowing Party leader Big Brother seems eerily relevant in a world of alternative facts and identify theft. With a strong new cast in the New York production, this multi-media driven project tests both the audience’s tolerance for violence and knowledge of the original text. With a claustrophobic set by Chloe Lamford that looks like many a municipal office in the UK, we immediately feel the oppression of constant surveillance. Sudden, bold light changes and crashing sound effects, suggest that every little move is being watched and recorded. On a sloping screen above the stage, filmed images–some live, some recorded–frequently supplement the action. Tom Sturridge powerfully portrays the harried, exhausted Winston Smith and demonstrates the toll that Big Brother’s presence takes on the population. But unlike previous film and television productions of 1984, here Big Brother is never given a face. This works well for the era of smartphones and in-home devices like Echo and Google Home, where screens and monitoring play a part of our everyday lives and we casually share all our secrets with these faceless objects. Although Orwell’s novel was written long before smartphones were even imagined, this production frames the narrative around a group of people from 2050 who are reading Winston’s secret diary. They put their cellphones away in a box to avoid being hacked and proceed to privately discuss whether the events he wrote actually happened and if he was a real person. Apart from this framing device, the production hews closely to the original text. Winston could be described now as a “fake news” creator as he spends his days expunging the records of awkward truths the Party wants “corrected” or changed. The accompanying ensemble cast plays an array of characters including standout Wayne Duvall as a jovial colleague who repeats the same story every day to Winston. Reed Birney extends his Broadway winning-streak with a chilling rendition of O’Brien, the creepily restrained Party representative. Winston embarks on the ultimate rebellion when he meets and falls in love with Julia, played by a haunted-eyed Olivia Wilde in her Broadway debut. While Winston struggles to conceal his hatred of authority, Julia is adept at publicly towing the party line. Winston watches Julia enthusiastically participate in a ritual of their time–a Two Minute Hate session–with a mixture of horror and awe. 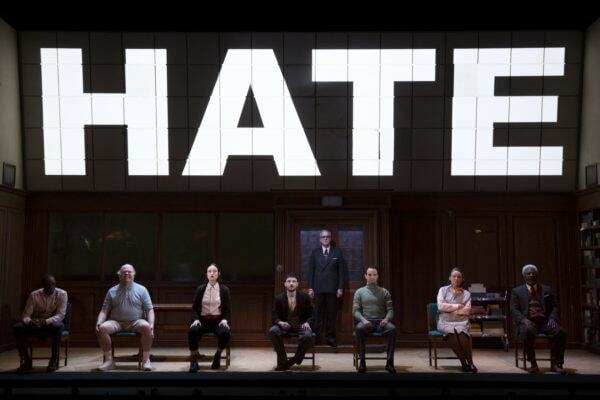 The cast stands on chairs at the front of the stage and spews hate messages to order in a manifestation of Party brainwashing that would make North Korea envious. Above their heads we see the film of the object of their derision and his callous murder. Because such fraternization is forbidden, Winston and Julia find a hidden room to hold their trysts. This is where this 1984 becomes wholly 21st century. All the action in the room is relayed to the audience by way of a live camera. Their assignations are livestreamed for us to eavesdrop on or even perhaps share, were we watching on our phones. It’s like a particularly fraught episode of the reality show Big Brother. But this is the calm before the storm. Of course, the kind man who lent them the room was working for the Party and they are tortured for their treachery. Here again, our familiarity with hideous televised torture by terrorists seems to be the reference. Captors dressed in white HAZMAT suits viciously punish Winston in a white cube torture chamber. Without giving too much away, this scene had the audience visibly squirming and covering their eyes. While we may be accustomed to such violence every day on the news, the graphic approach used here is gratuitously shocking. Sales of the novel 1984 have seen a boom since the beginning of the Trump administration. The book that not only coined the phrase “Big Brother” but also “double speak” and “group think” resonates in uncomfortable ways. The play seems to ask if anything has changed since Winston wrote his diary and suggests that the Party still has a stranglehold on the world but no one knows the truth. “They will not look up from their screens long enough to realize what really happened,” someone from the future aptly comments. This is a 1984 that encapsulates why we still read this novel and why we should still speak truth to power.